I recently went to Klang on a seafood adventure with rif, Jeen and Han. 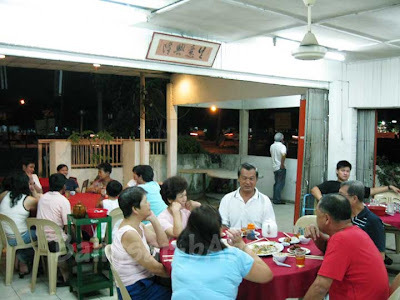 As it was a new area to us, we drove around Klang town like blind bats, looking for a particular restaurant which we did not find. An hour later, my stomach started rumbling so I suggested another alternative. 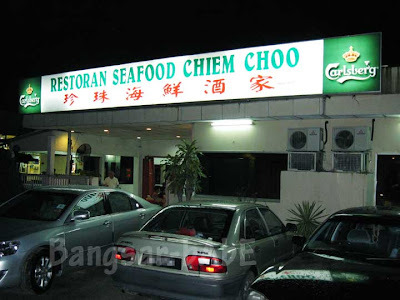 I checked Garmin and Chiem Choo Seafood Restaurant was the first to appear. Ravenous, we settled for this. The place was not packed, but it took them a rather long time to take our orders. I looked around to see what other people were having and ordered based on that. We had to wait for almost an hour. By then, I nearly chewed the table out of hunger. 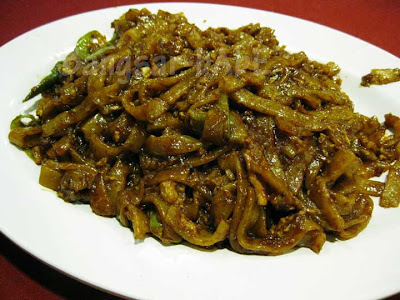 Prepared Hokkien-style, the tapioca noodles looked like a heap of mess. However, don’t be deceived by its looks. With a sticky and slightly chewy texture, the noodles were brimming with “wok hei” and contained bits of crispy lard. Very unique we thought, and the plate was wiped clean in less than 5 minutes. The squid (RM12) were fresh and crunchy. 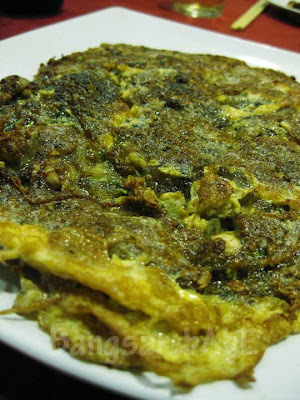 Cooked just right, the fiery green chili paste further accentuated its sweetness. Jeen and I found this average, as we both love our squid to be deep-fried. The tofu (RM10) was bland and badly cooked. There was hardly any minced pork and the gravy was too starchy. Very disappointing; don’t bother with this. 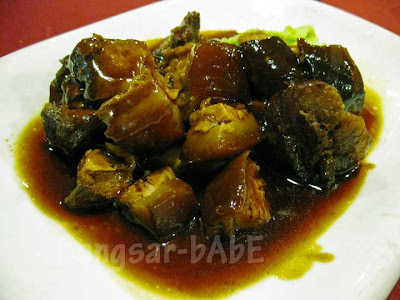 o_0 On the other hand, we were pleasantly surprised with the tung po yuk (braised pork belly) – RM15. 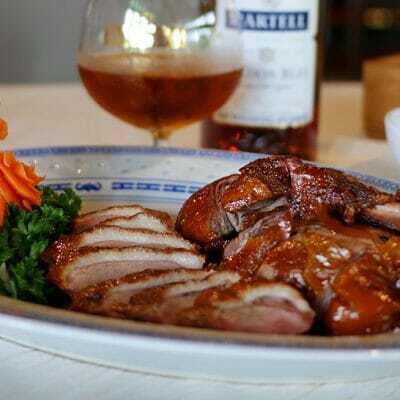 This simple dish got the thumbs up from us. The thick gravy was full of flavour and the pork was meltingly tender. It tasted divine with the fluffy mantau buns. I moped the plate clean with my mantau! =P The Oh Chien (RM20) was slightly burnt on the outside. Taste wise, I found it too starchy and the oysters were very, very small. The egg mixture was vinegarish, which I didn’t like. rif and Jeen thought it was something different and nice in its own way. 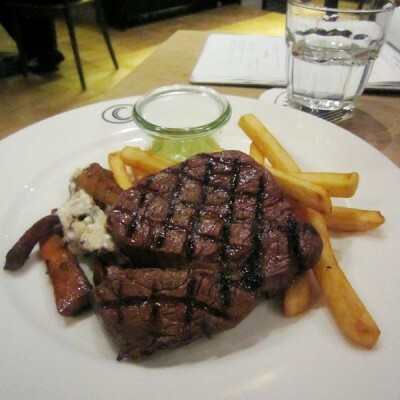 All in, dinner cost RM 71.20 for the above. 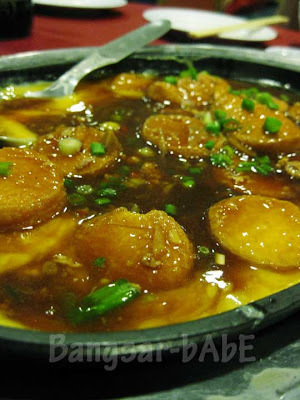 Although the noodles and braised pork were good, I found the food in general, average. Service was awful. We waited for more than 2 hours for all our dishes to be served! Verdict: Try the tapioca noodles and pork belly. Don’t bother with the tofu. The thing that jumped out at me here was the squid with the green chilli paste! Seafood best done simple! The tapioca noodles really does look like one hot mess, but I’ll take your word for it! Klang, here I come! 550ml, I second that! I think I’ll love the squids with the FIERY chili sauce..
that noodle looks tempting and i think i’ll like the squids, simple and just w the sauce. 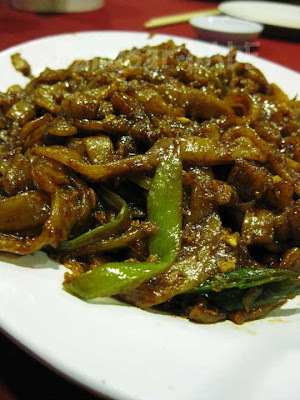 A better choice for Klang food would have been the Western Klang ( Westport/Banting side ) of Pandamaran or Teluk Gong. Klang food is very average if you dunno which one to lookout for, and yes for 3 hours you will have already reached good old Simpang Dua , paid 1/2 the price and still have enough petrol to come back to KL ( plus tapau 2 bottles of red wine ) ! BSG – Yar…should have just gone to Teluk Gong! 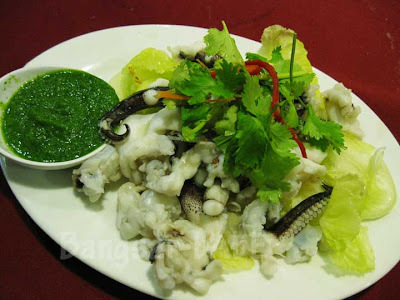 thenomadGourmand – The squid is simple, and if you appreciate steamed seafood, you’ll like this too! Leonard – I heard about this place. Is the food good? sounds like a place that will drive me mad with the waiting time..! Joe – Hehe…it drove me up the wall!! hmm … 2 hours of wait? i wont go for all it’s worth. somemore i dun like dark dark noodles, (though i like lards!). i find the squids rather appetizing. I agree with you…only the tapioca noodle worth visiting the place. I stopped patronise this place cos they don’t price their food consistently. 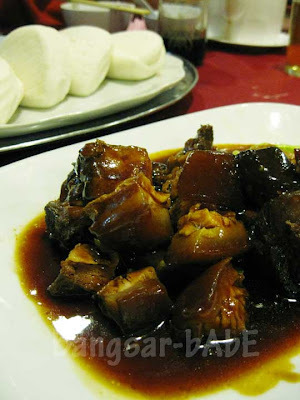 Hmmm…I want to go try foodbin’s recommendation – Restoran Hua Xing, Seri Setia.